A few weeks ago I had the good fortune to meet a handful of local talented musicians in an afternoon session I delivered at the inaugural Port Moody Youth Arts Festival, where through the course of an afternoon we would set out to write a song. In addition to the afternoon workshop, my name was slated for half an hour as the opening act of the evening showcase, and I hoped that I wouldn’t be standing on the stage explaining a failed effort. I prepared the sparest of materials to make the most of our time during the afternoon, and spent my energy providing the space and the canvas, along with whatever emerging know-how I’ve gained in the last year about what makes songs come together and what they require to be performed convincingly I could. Fortunately, the Port Moody teens who had signed up for the workshop were exceptionally talented writers, musicians, collaborators, and performers. 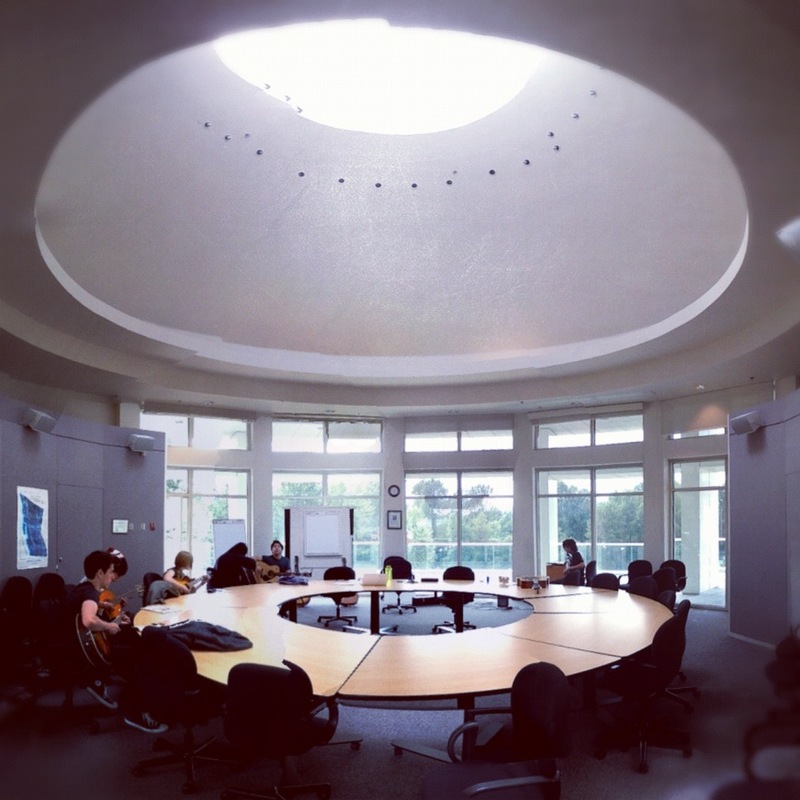 The workshop was scheduled for the top floor of City Hall, a vaulted dome ceiling befitting our quaint suburban capital with a veranda that offered a view of Inlet Park, the rec center, and public library. It seemed a dignified place to be crafting a song out of the ether, and even if this went unspoken, the group set about searching for riffs and opening hooks, imagery and themes in pairs and individual spots around the space with diligence and urgency. At fifteen minute intervals, the group met as a whole to share the pieces they had come up with, and teach them to one another. Eventually, the collective settled on an opening verse by a marvelous budding singer-songwriter named Julia, and while she retreated to the patio to extend the verses and lyrics, the rest of the group experimented with various other instrumentation that began to bring the song to life: acoustic guitars, bass, ukelele with slide, drums, a twelve string. As a few of the participants were called to the stage to soundcheck their own band, Julia, Mickelvin, and Patrick worked to develop a chorus with transitions and complimentary guitar licks that built a musical tension throughout the song, and it was quickly typed up and photocopied in the library downstairs. There were a few last minute run throughs in the evening light of the floor-to-ceiling windows, and at five o’clock we broke for dinner. 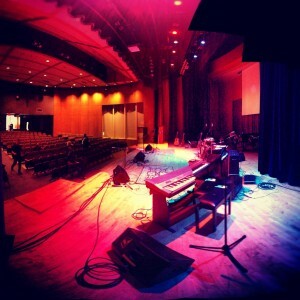 The evening showcase was set to begin with us at six-thirty, and the group had yet to play the song on stage. But after a handful of run-throughs after dinner, the mood was relaxed while the newly minted band hung out with the evening’s emcees and the other acts, picking at pizza and veggie platters before being called to the stage. I introduced the group and provided a brief summary of the day’s events, and then scurried into the audience to record video as the troupe proceeded to bring the house down. In a scaled down version of the Thirty Person Rock Band Project, the workshop was a success for the way it allowed the individual talents of the participants to shine. Julia, Mickelvin, Patrick, Theo, Ian, Isaac, Jonathan and Michael came to the session open to who they might meet, and what they might be able to make together. They all rose mightily to the occasion.